Sweet potatoes and yams contain many nutrients that make them a healthy addition to a weight loss meal plan. While similar, the two are not the same vegetable, and yams are not as easy to find in the United States. Sweet potatoes are higher in nutrients than yams, but both are a nutritious way to fill your stomach while trying to lose weight. Weight loss occurs when you burn more calories than you take in. Reducing the amount of fat and calories in your diet and adding exercise every day is the healthiest way to do this. Incorporating healthy foods into your meal plans and adding a daily workout are lifestyle choices that allow you to lose weight and keep it off. Sweet potatoes and yams contain many nutrients, including vitamins A and C, calcium, potassium and magnesium, but sweet potatoes are higher than yams in all these vitamins and minerals. Balance their calorie content with the foods you eat the rest of the day to enjoy them without hindering your weight loss efforts. When creating weight loss meals, it is important to balance the fat and calorie content so that you stay within your daily goals. A sweet potato or yam is a good choice, but if you filled up on soda or fast food at other meals, you may have derailed your weight loss goals at the end of the day. A cup of baked sweet potato with skin contains 180 calories and 0.3 grams of fat. A cup of cooked yam has 158 calories and 0.19 grams of fat. Fiber is a powerful tool for your weight loss arsenal because it bulks up in your stomach and digests slowly, leaving you feeling full for longer. Sweet potatoes contain almost 7 grams of fiber per cup and yams have just over 5 grams per cup. With daily intake recommendations being 22 to 34 grams, depending on age and gender, both are a good way to fill up without filling out. In addition, sweet potatoes and yams are both very low in fat and contain under 200 calories per cup. A serving of either is a good addition to a meal that will help you refrain from reaching for unhealthy snacks between meals. Sweet potatoes and yams are versatile and appear in a variety of recipes, allowing you lose weight without being bored with the same meals. Slice sweet potatoes, spray with cooking spray and roast in the oven until crispy for a healthy alternative to potato chips or French fries. Serve baked or mashed sweet potatoes with pork, beef or chicken or stuff roasted yams or sweet potatoes in a tortilla for a burrito. Toss either item into soups, stews or casseroles. Candied sweet potatoes or yams may be a dish you want to skip because it is often loaded with butter, marshmallows and sugar, which dramatically increases the fat and calorie content. 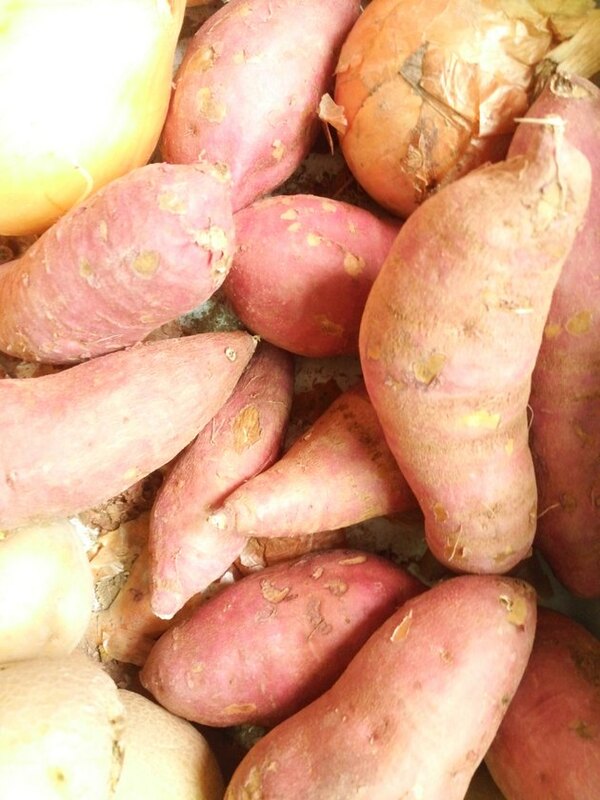 Texas A&amp;amp;M: What is the Difference Between a Sweet Potato and a Yam?